A. What method is right for your needs? ToP methods are powerful and specialized for different purposes. Having scoped the meeting as discussed in session 1, you should have clear rational and experiential aims. Does the group need to have a productive conversation on a topic so the are clearer on issues involved? 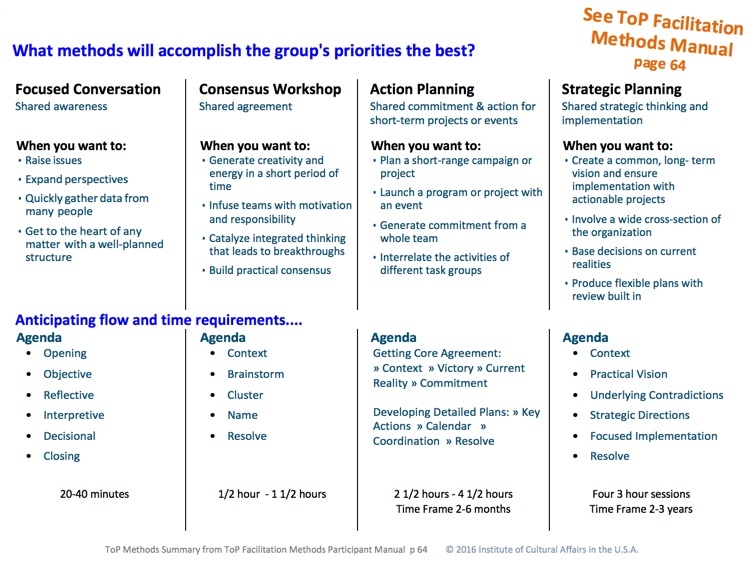 Does your group need to reach agreement or convert an agreement into action? Matching Methods to Needs provides an overview of the methods, work they are best suited for, the essential phases they contain and approximate time requirements. B. What are major considerations when customizing your design? Sometimes situations require customization. Customizing a meeting design properly means really understanding what you are trying to do. 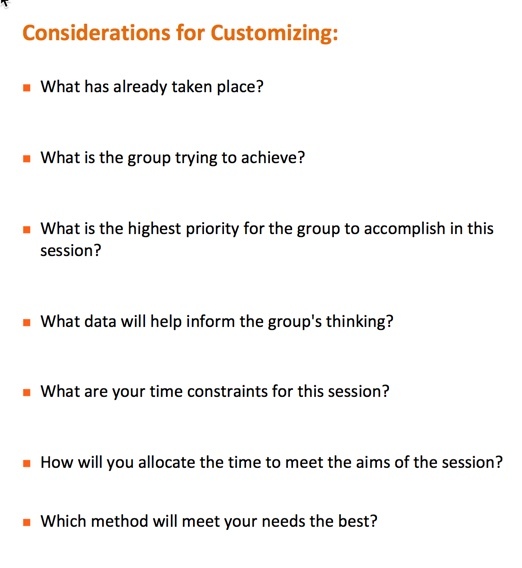 Considerations for Customizing provides a handy list of questions to answer during the design process to create a meeting that is intentional and productive. C. How can you leverage your experience? Developing knowledge through taking ToP courses, seeking coaching, working with colleagues is important. Also important is leveraging wisdom from your own experience. 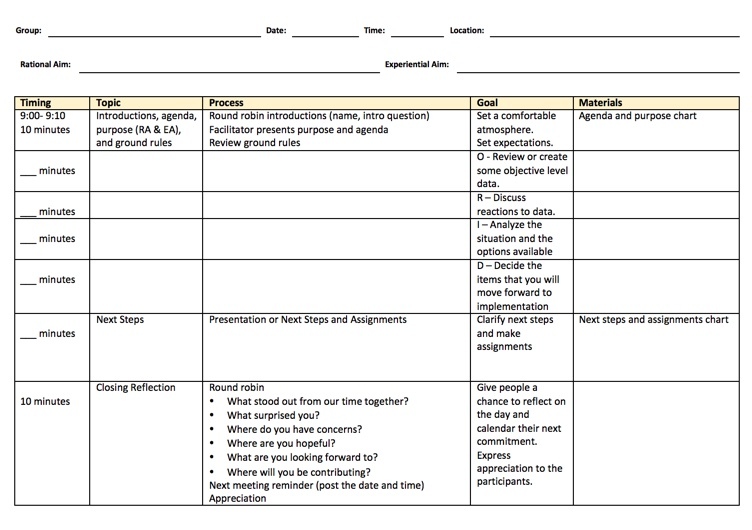 The Meeting Reflection Debriefing Tool provides a structured way to reflect on a facilitation and record observations in order to deepen learning about yourself and facilitation. D. What is a simple tool to use for design? Designing a meeting can be daunting at first. 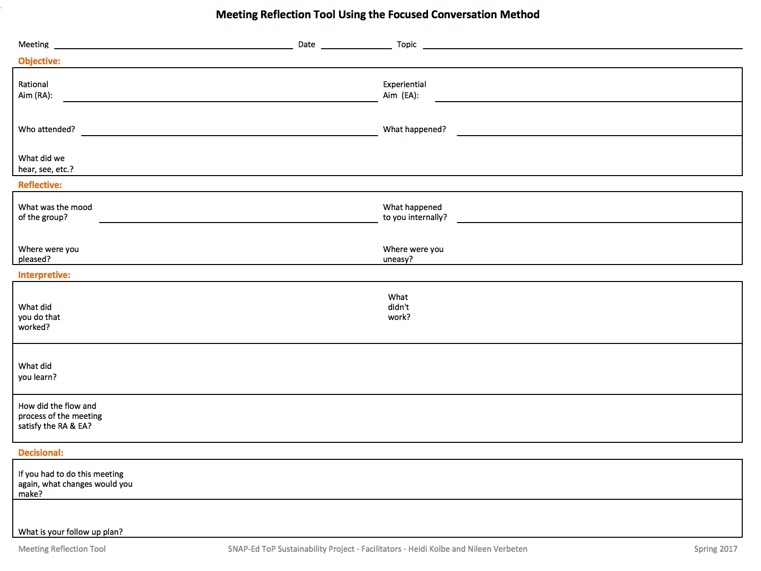 The Basic Meeting Design Tool is designed to use the focused conversation method as a framework for a meeting. The tool includes prompts (see Goal) that what content is appropriate at each level. Spaces for Topic and Process hold questions to be asked and any special instructions that are key to the process. Finally, there is a column to record the anticipated time to spend at each level and another to capture any materials you'll need to be sure to have ready.